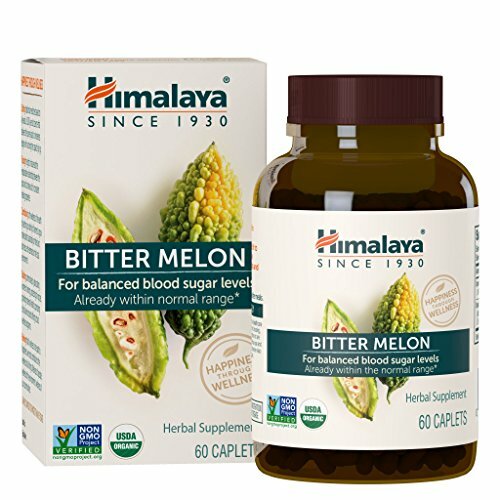 If you need blood sugar support and an organic choice for glucose metabolism, Himalaya Organic Bitter Melon is your top choice.The bitterness of the Bitter Melon fruit was key to its early discovery by ancient physicians who used it to strengthen the digestive potential for sweet foods and to support balance. Modern research has revealed an array of unique plant compounds that mirror and support pancreatic function and insulin production. Himalaya Organic Bitter Melon includes a unique plant compound called polypeptide-P, which when used along with a healthy diet, supports blood sugar levels already within the normal range. Himalaya Organic Bitter Melon also supports several tissues including the kidneys, eyes and peripheral nervous tissues. Himalaya Organic Bitter Melon comes in a 1-month supply, and the recommended use for adults is 1 caplet twice daily after food. All Himalaya products are formulated to support your body’s organ systems and their normal function, and are rigorously studied for purity, safety and efficacy. Himalaya Organic Bitter Melon is Certified USDA Organic, Non-GMO Project verified, vegetarian and vegan, and is free from gluten, soy, wheat or corn. It is also produced in a cGMP facility and contains no magnesium stearate or capsules made of animal gelatin. Himalaya Bitter Melon comes in a caplet made using no artificial tableting glues. Caplets are held together using the sticky parts of the plant itself. Himalaya herbs are wildcrafted and grown sustainably through fair trade farming partnerships with over 5,000 independent farmers.When it comes to natural herbal products used and trusted all over the world, it’s Himalaya since 1930.